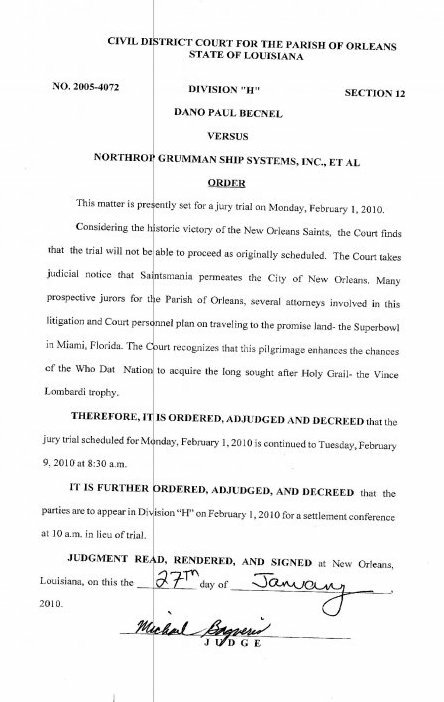 Considering the historic victory of the New Orleans Saints, the Court finds that the trial will not be able to proceed as originally scheduled. The Court takes judicial notice that Saintsmania permeates the City of New Orleans. Many prospective jurors for the Parish of Orleans, several attorneys involved in this litigation and Court personnel plan on traveling to the promised land - the Super Bowl in Miami, Florida. The Court recognizes that this pilgrimage enhances the chances of the Who Dat Nation to acquire the long sought after Holy Grail — the Vince Lombardi trophy. THEREFORE, IT IS ORDERED, ADJUDGED AND DECREED that the jury trial scheduled for Monday, February 1, 2010 is continued to Tuesday, February 9, 2010 at 8:30 a.m. The judge ruled on the matter sua sponte. He later told a reporter that he would not be holding any jury trials during the entire week following the Super Bowl because, he said, after the Saints win, "everyone will be in a really good mood." I am informed that the "Who Dat Nation" is a loosely affiliated organization of individuals, including but not limited to Louisiana residents, who are wont to express a general skepticism as to the chances of any football team opposing the New Orleans Saints, typically expressing said skepticism in a chant that was roughly translated for me as, "Who is that saying that they may be able to defeat the Saints in a game of football? Whoever it may be, to us this seems quite unlikely." The Colts are a great team, but I have to root for the Saints if only because Who Dat Nation has been through so much over the last few years. Whatever happens, it is probably best not to schedule anything in New Orleans during the following week.